The NY State Attorney General’s office continues to take the praiseworthy, forceful steps to protect the Seward House Historic Museum’s Thomas Cole painting that it unaccountably declined to take to protect the Hispanic Society of America’s now dispersed coin collection. 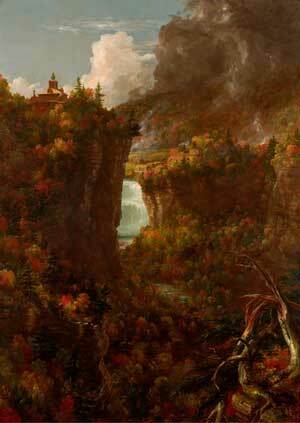 This week the AG filed in State Surrogate’s Court for Cayuga County his formal response in support of a petition filed last month seeking the permanent prohibition of the sale of a Thomas Cole painting, “Portage Falls on the Genesee,” 1839, that had long hung at Seward House in Auburn, NY. In February, the Fred L. Emerson Foundation, which owns that painting, removed it from the house and announced plans to sell it and share some of the proceeds with the Seward House Historic Museum. The AG’s filing was a strongly supportive response to the petition to stop the sale that was entered in Surrogate’s Court last month by Ray Messenger, great-great-grandson of William H. Seward, New York Governor and later U.S. Secretary of State under President Lincoln. Messenger is administrator of the estate of Secretary Seward’s grandson, William H. Seward III, who had bequeathed the historic house to the Emerson Foundation, with explicit instructions for the foundation to preserve and maintain the house and its contents. Needless to say, we are extremely happy. However, it is not the end of the battle. The attorneys for the Emerson Foundation and Seward House Museum are to submit their responses to our petition by Oct. 4. Until we see the responses, we won’t know what the next step [emphasis added] will be. The “next step” for Attorney General Eric Schneiderman should be revisiting the deplorable disposal of the Hispanic Society’s coins in the same spirit in which he has now chosen to address the potential loss of the Cole. He has leaped to the defense of that painting “on behalf of the ultimate beneficiaries of gifts for charitable purposes,” as he states at the beginning of his court filing. He should do no less (albeit belatedly) for the intended “ultimate beneficiaries” (the public) of Archer Huntington‘s munificent gifts as founder of the Hispanic Society of America in New York City.